If you dig deep enough you will find some ‘potentially’ decent sleeper candidates when you draft this season. And the key word here is ‘potentially’. With a plethora of very talented wide receivers at your disposal, the running back position requires more studying and careful selecting than ever before. We did some deep-sea fishing and came up with what we think are some of the best sleeper and deeper sleeper running backs for you to consider, especially those in leagues of 12 and higher. They are in no particular order. 1. Andre Williams-RB-Giants- Williams now becomes a true sleeper now that David Wilson has been forced to retire following a neck burner that doctors felt had too serious an impact on his already surgically repaired neck. With Rashad Jenning pencilled in as the starter in New York, Williams, who was a complete beast in his last season at Boston College (2,177 rushing yards/18 touchdowns) will now get a larger share of the carries and becomes Jenning’s backup. This kid can light it up on the gridiron. 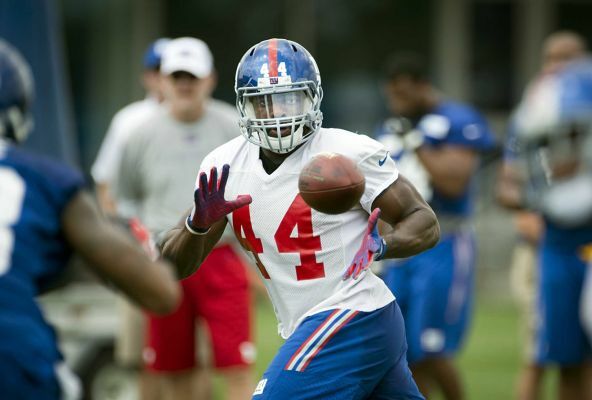 #44 Andre Williams, with David Wilson retiring, now becomes a viable backup and handcuff to Rashad Jennings says the Furnace. Photo: Newsday / J. Conrad Williams, Jr.
2. Jordan Todman-RB-Jaguars- Once you get deeper into the draft, there isn’t a much better handcuff to be found while your other owners are nodding off trying to find players to fill their benches. As the back up to an unproven Toby Gehart, who seems to be going far too early in most drafts, Todman will see more than his fair share of carries on a team devoid of much offense in the first place. 12-team mixed leagues would be the perfect place to roster this potentially able back. 3. Devonta Freeman-RB-Falcons- We like this 22 year old even more than the other two backs that Atlanta will throw out there this season. Soon to be 31 year old Stephen Jackson, who is already one of our “Bust” candidates, is too fragile to last the season and we simply are not all that impressed with Jacquizz Rodgers. Once SJax goes down with an injury, Freeman, selected by the Falcons in the fourth round, will be next on the depth chart. He had 1,106 rushing yards plus another 278 receiving, while tallying 15 touchdowns in his final year at Florida State. He will make for an excellent backup with enormous upside. 4. 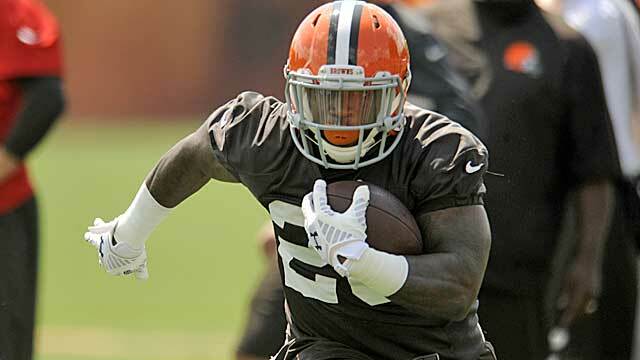 Terrance West-RB-Browns- It’s true that fairly reliable RB Ben Tate will probably start for the Browns, but like every featured back, they need a backup, or in fantasy terms, a handcuff. Not only do we think that West is both of these but he should potentially play an even greater role in Cleveland this year otherwise why would the Browns have made West their third round pick? In West’s last year with Townson State, (you better be sitting down for this) West scored 41 touchdowns with 2,509 rushing yards and another 258 receiving. Well worth the stash! 5. Bernard Pierce-RB-Ravens- As our last selection, and probably our deepest sleeper, we chose Pierce not because he has proven that much given his under-achieving season last year, but also because Ray Rice is not the same back that he used to be given his drop-off last season. However, Pierce should see more carries than he has in his career and because he’s young and raw, has the potential to build on his 540 all-purpose yards that he posted in very limited action last year. Low risk, high reward. The Giants need some offense that is for sure . Glad to see Jamaal Charles finally being rewarded in terms of a contract after the productivity over the past three and a half years . Can’t wait for the start of the regular season ! Who has more to prove in your mind in terms of Eli and Peyton ? I believe this season could very well be Peyton Manning’s last with the Broncos . In the case of his younger sibling , it will be all or nothing , for Eli Manning and the New York Giants . I truly believe the NFC East to be vastly overrated and one of the worst divisions in the entire NFL . Just like last season, the NFC East will at best be the least competetive division in football. Eli will definitely be playing in a fishbowl this year although after last season’s demise he has only one way to go, and that’s up. On paper the Giants look good . Looking and playing good are two different things . I’m hoping the Browns can do something- anything- this year. It’s been too long for those fans.